The Heights Morning Market is our new outdoor, morning market taking place every 2nd and 4th Saturday of the month on 7th Ave, south of Armature Works. This event is free to attend, family-friendly, and features live music at each event. 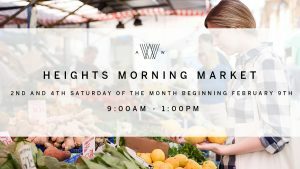 The first Heights Morning Market event will begin February 9th, 2019 from 9am - 1pm. … Continue reading "Heights Morning Market"
Join us for the February edition of Kids in the Kitchen with Ms. Alyna and an unforgettable hands-on experience for your child. Learn how to prepare heart shaped four cheese ravioli and focaccia bread from scratch. Mix, stir, measure and pour while building your cooking skills and vocabulary. Afterwards enjoy your delicious creations! 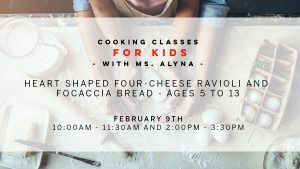 Cooking with Ms. Alyna … Continue reading "Kids in the Kitchen w/ Ms. Alyna"
Celebrate Chinese New Year at Armature Works on Feb 9th from 2:00pm- 4:00pm. 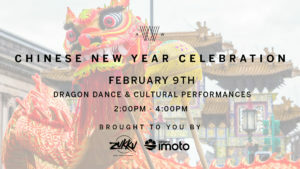 Join Ichicoro and Zukku in celebrating The Year of The Pig, with a traditional Dragon Dance through Heights Public Market and authentic Chinese Dancers on the Front Lawn. Also, lookout for the Taiwanese Third Prince who will be passing out traditional red … Continue reading "Chinese New Year Celebration"